1 How to Buy 20 TK POF Cancer Hospital Lottery Ticket 2019? 2 How to check POF Lottery Draw Result 2019? 20 TK Lottery Draw Result Bangladesh! The 20 Taka POF Lottery Result 2019 Draw Date is 13th April, 2019. 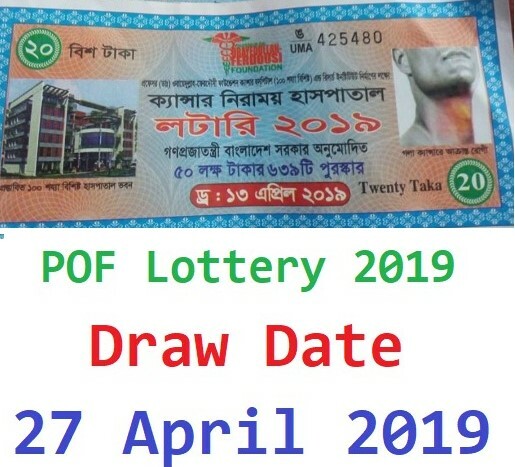 On the month of 17th February, 2019 the Professor (Dr.) Obaidullah-Ferdousi Foundation Cancer Hospital and Research Institute published a lottery ticket for Bangladeshi people, whose name is POF Foundation Cancer Hospital Lottery 2019. The last date of POFF Cancer Hospital and Research Institute Lottery Ticket is 2nd April, 2019 and official POF Lottery Draw Date is 13th April, 2019. If you want to buy a POF Lottery Ticket 2019 before 2nd April, 2019? Just follow below instruction. 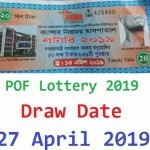 News Update (14/04/2019): POF Lottery 2019 Draw Date Change – New Date of POF Lottery Result 2019 is 27th April, 2019. 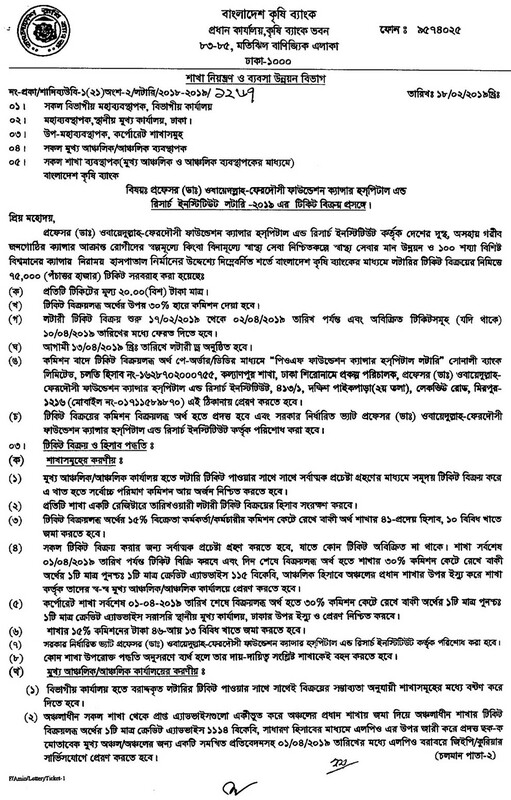 News Update (13/04/2019): Today Professor (Dr.) Obaidullah-Ferdousi Foundation Cancer Hospital & Research Institute not published the POF Lottery 2019 Result PDF File & Image. To buy a POF Lottery Ticket by Mobile SMS, Just type “pof” send to 16329. The 20 Taka POF Foundation Cancer Hospital and Research Institute Lottery Ticket Official Draw Date is 13th April, 2019. After publishing the result, you can easily check POF Lottery Result 2019 by sending an SMS like as below format. 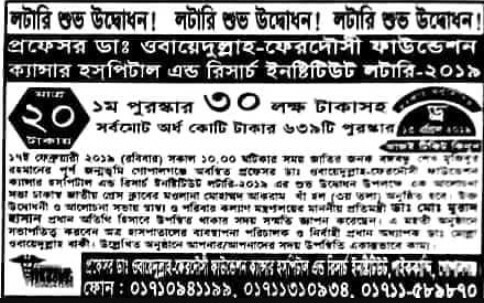 Bangladesh Cancer Society Bangladesh Cancer Society Hospital & Welfare Home Lottery Ticket-2018 Draw 9 February 2019. Check: Buy Through SMS Type “BCS” send to 16329 Draw 9 February 2019. The first prize winner of the lottery is Cha 0448954. The second and third prize winners were respectively KA 0359749 and Jha 0411185. The first prize winner will get cash of Tk 25 lakh, the second prize winner will be Tk 3 lakh and the third prize winner will get 60 thousand taka. BFF Lottery Draw Date is 26 May, 2018 (It was 5 May but rescheduled to 26 May 2018). Buy ticket through SMS, Type “BDRCS” send to 16226 Ticket will be available till 26 December, 2017 Draw 6 January, 2018. Type “MANOS < > Series & Ticket Number ” send to 6969 -If You Buy it From Robi SIM, Then Type “R” send to 16349 to get result (free). Check Result through SMS Type “BTS< >Ticket Series” send to 6969.